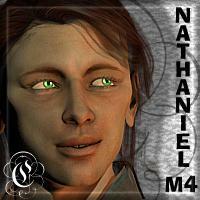 Nathaniel is a complete texture and morph package for Daz3D's Michael 4.0 and Morphs++. You do need both of those packages to be able to use him fully. I shut down my Content Paradise store a few months ago, and I'm finally getting around to moving some of that content into my freebies, and fine-tuning some other parts of it for inclusion into my HiveWire store. Nathaniel here is a migration; he was sold over on CP for a few years, and I have decided to put him into my freebies now, as I just don't believe his quality is representative of what I can do these days. It's hard to find nice characters for M4, so I really appreciate that you made this one available. I look forward to using it! Thank You fir this very nice character.